Pickled shallots are excellent on a relish tray or as a salad topper. Plan ahead to let these steep at least 1 week before using. Pickled foods are those that have been preserved for later consumption in brine (a salt-water solution sometimes with added sugar) or a vinegar mixture. They are considered to be cured (but not in the same sense that meats and sausages are cured). Fruits, vegetables, meat, and fish can all be pickled, and they can have a sour, sweet or spicy flavor. Not all pickled foods are canned, the method of cooking foods sealed in jars in either a water bath canner or pressure canner to preserve them. 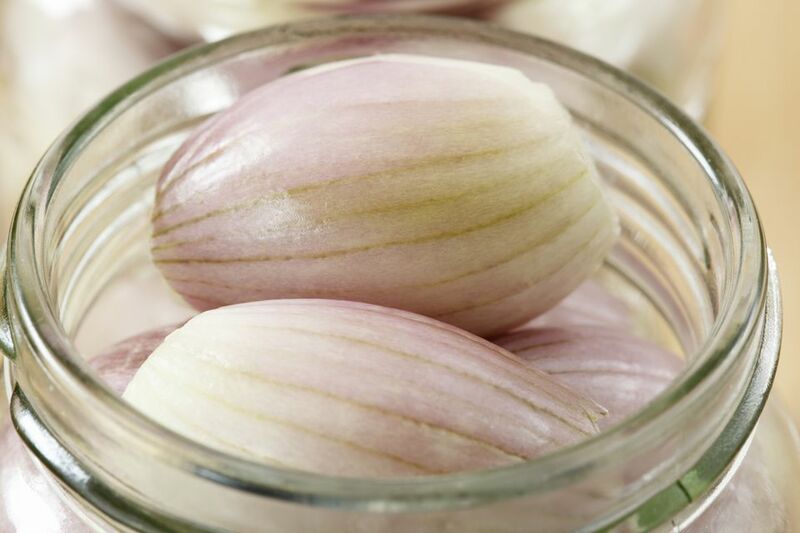 The pickled shallots in this recipe are refrigerated and can be held there safely for up to 2 months. White-wine vinegar is used in this recipe because red-wine vinegar, its slightly stronger counterpart, would darken the shallots and ruin their appearance. If you don't have or don't like the flavor of savory, you can substitute it with other fresh herbs, like thyme, marjoram, or sage, but the flavor will be different. Recipe reprinted with permission from Judy Gorman's Vegetable Cookbook by Judy Gorman (MJF Books). Peel 1 pound shallots. Trim both ends and separate the cloves. Set aside. In a wide, nonreactive saucepan (stainless steel or enamel but not aluminum), combine 1 1/2 cups white-wine vinegar, 1/2 cup sugar, and 1/2 teaspoon salt. Bring to a boil, stirring to dissolve the sugar. Add the peeled shallots and stir to coat evenly. Cook briskly for exactly 1 minute and remove from the heat. Submerge the sprig of savory in the pickling liquid. Allow the mixture to stand until it cools to room temperature. Transfer to an impeccably clean or sterilized glass bowl or jar with a lid. Cover the bowl or cap the jar and refrigerate for at least 1 week before tasting. Shallots will keep this way for up to 2 months. Serve as an appetizer with wooden picks, or use as a salad component or part of a relish tray.